The court found Iran, the country’s central bank, and the Islamic Revolutionary Guard Corps liable for the deaths of more than 1,000 people in the September 11 attacks. District Judge George Daniels ordered Iran to pay “$12,500,000 per spouse, $8,500,000 per parent, $8,500,000 per child, and $4,250,000 per sibling” to the families and estates of the deceased, court filings say. How, exactly, the court came to this decision remains a mystery. A total of 15 of the 9/11 perpetrators were citizens of Saudi Arabia, while two were from the United Arab Emirates, one was from Egypt, and one was from Lebanon. Exactly zero of them were from Iran. Even the 9/11 Commission, tasked with investigating the attacks, found no evidence of direct Iranian support. The only mention of Iran in the report says that certain 9/11 hijackers traveled through Iran on their way to Afghanistan, without having their passports stamped. This is not the first time such a ruling has happened either. Daniels issued other default judgments against Iran in 2011 and 2016. Iran has not responded to the any of the rulings. Last year, however, Iranian Foreign Minister Mohammad Javad Zarif dismissed such accusations as ridiculous. “A record low for the reach of petrodollars: CIA & FDD fake news w/ selective AlQaeda docs re: Iran can’t whitewash role of US allies in 9/11,” he tweeted last November. It is important to point out how highly suspicious the timing of this ruling is. It comes at a convenient moment as neocon war hawks push for war with Iran and as Israeli Prime Minister Benjamin Netanyahu begins saber rattling with the regime, claiming that they are lying about their nuclear program. 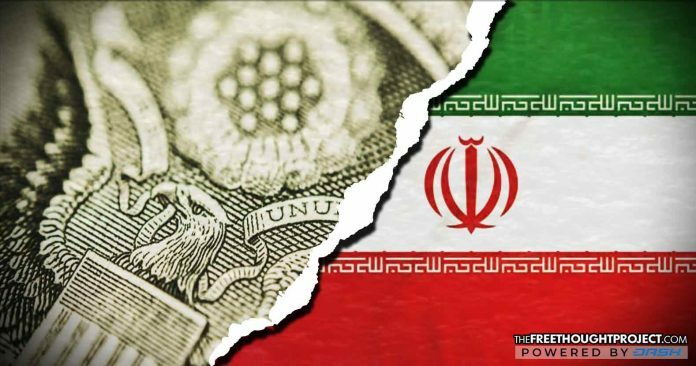 What’s more, Iran recently announced it is dropping the US dollar in foreign trade. It should be noted that shortly before they were invaded by the US, Iraq did the same thing. Libya also announced its plans to drop the US dollar whose leader was then murdered and dragged through the streets as NATO-led allies launched a bombing campaign, turning the oil-rich nation into a terrorist wasteland of rubble and carnage. Almost immediately after Muammar Gaddafi’s murder, the US-backed rebels in Libya formed their own central bank and were given leave by the US and the UN to legally sell oil from the lands which they confiscated. To recap, as the war drums beat for Iran who recently announced their decision to drop the dollar, a court implicates them in 9/11 despite having no evidence, and the media simply reports it without question. Seems legit. It is also important to point out that the US does have evidence that Saudi Arabia aided the 9/11 attackers, and in spite of thousands of victims and their families attempting to sue them for years, a ruling similar to the Iran one is non-existent. As TFTP has previously reported, thanks to the release of the 28 pages, Americans and the rest of the world now know that Saudi Arabia played a significant role in the September 11th attacks. Also, thanks to the release of 28 pages, we know that the US government was complicit in covering up Saudi Arabia’s role in the attacks. And, as this ruling against Iran illustrates, they show no intention of changing their ways.